2016 homage by Chris Barker. Those of us who admire music-makers of renown shared many hard losses over the past year. And many us who treasure our own music scenes have lost local heroes as well. Time passes, and young lions grow older — since their mortality reminds us of our own, and the music they made reminds us of our receding youth, it’s always personal. 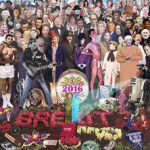 And for those of us of a certain age, 2016 seemed way too close for comfort.